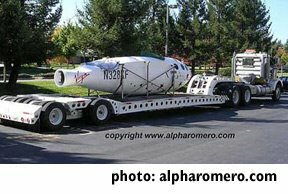 Those of us who live on the Internets and use “The Google” often surely must have heard the wild rumors circulating recently that “The Google” had bought SpaceShipOne from the National Air and Space Museum to hang in their lobby. So we can all go to sleep tonight knowing the real SpaceShipOne is safe, sound, and still hanging in the National Air and Space Museum’s “Milestones of Flight” gallery at their Mall museum in WDC. Oh, and for those who are scratching their heads wondering why I am using the term “The Google” when you, me and everyone except W knows it’s simply “Google”, click here for the hilarious explanation. If you want to, try sending Ol’ George one of them thar email thingys using “The Outlook”…sorry, could not possibly resist a little snark action so close to the election.